Trams and trolleybuses run on electricity from overhead cables and produce no emissions at street level. Because the electricity is generated centrally at a power station, it works out much more efficiently in terms of energy consumption than an onboard internal combustion engine, even if the electricity is generated from fossil fuels. The amount of carbon dioxide released will get smaller still as more electricity is generated from renewables, or if, as in Moscow, it is generated from local combined heat and power stations, where the waste heat heats the surrounding buildings. The lack of pollutants at street level is good for human health. Both trams and trolleybuses can cause “modal shift”, i.e. attract more motorists onto public transport than buses can. This reduces emissions from cars, making electric transit even greener and better for human health. There are some cost advantages of electric transit systems too. The electrical equipment in trolleybuses and trams is inherently longer-lived and cheaper to maintain than the diesel engine and its associated transmissions and its noise and emissions control systems - none of which are needed in electric vehicles. Trams and trolleybuses tend to be replaced less frequently than diesel buses, offsetting the initial outlay. 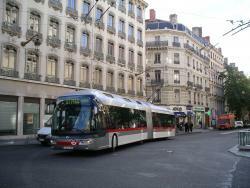 Which is the best form of electric transit: trams or trolleybuses? There is no simple answer to this question - whether trams or trolleybuses are better in a particular town or city depends on many factors, including how many passengers need to be carried, whether there is a railway system which is going to be converted to light rail or tramway use and how much space there is for segregated lanes. How much do trolleybuses and trams cost? Because a trolleybus system doesn’t require tracks and the diversion of utilities, the cost of installation is significantly less than for an equivalent tram scheme. A scheme with less segregated running could be up to 50% less than for trams. 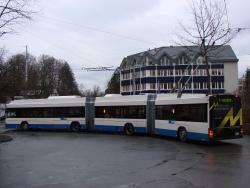 Trolleybus vehicles are less expensive to buy than tramcars. As trolleybuses require no track maintenance, they cost less to maintain than either trams or diesel buses. What's the capacity of trams and trolleybuses? Geneva biarticulated trolleybus with capacity of 200Modern biarticulated trolleybuses such as those running in Geneva offer a capacity of up to 200, which is not much less than the 230 proposed for Edinburgh's trams. However, it is arguable that is is not necessarily to desirable to have the highest capacity vehicles possible. The argument for high capacity vehicles is that they cost less per passenger. However this argument ignores both the variability of loadings across the day between peaks, off peak and very quiet times and also ignores the other part of the 'bottom line equation' which is revenue, which is of course related to usage. In the rush hour, a typical double-decker bus on a busy route will be fully loaded (for at least parts of the route). To move the same number of passengers, fewer higher-capacity vehicles per hour are required, which means fewer drivers need to be employed at less cost. However, in the off-peak times of the day, vehicles may be only 10-15% full. If the frequency of the service is reduced in the off-peak times because of the bigger vehicles, this may make the route less attractive to passengers. If it is maintained, larger vehicles will be moving around at greater cost. This is not to say that high capacity vehicles are not needed, but that the issue of overall financial benefit against capacity of the vehicles is one that needs to be considered very carefully. Can trolleybuses get as many people out of their cars as trams? There doesn't seem to be much research about this. However, in San Francisco, Seattle and Salzburgh passenger numbers increase by 10-18% whenever diesel buses are replaced with standard trolleybuses - this could be higher with the modern trolleybuses that run in European cities such as Lyon and Milan. (See the Vancouver site in the Links for the US information). A figure quoted for trams is that 15-25% of people who used trams previously travelled by car. There will be factors independent of whehter it is a tram, bus or trolleybus that will influence the number of people switching, such as the convenience of the routes, reliability and amount of interchange required. Aren't trolleybuses less reliable than trams? In the past, trolleybuses had a somewhat exaggerated reputation for “coming off the wires”, but modern methods of constructing overhead wires make this very rare nowadays. Using battery power or an alternative fuel source such as diesel or biofuel, modern trolleybuses can also run for short distances without the wires, for example if there are diversions from the wired routes or in the centres of cities such as Rome and Beijing. This means they can be as flexible as diesel buses, moving round obstacles such as parked cars, or broken down vehicles, which would bring rail-bound trams to a halt till the obstruction was moved. Trams and trolleybuses share many similar components, and in some cases, literally the same equipment. Where are there trolleybus systems in the world? Modern trolleybus in LyonThere have been a number of new systems installed, refurbished or extended over the past few years in Western Europe, for example in Lyon, Athens, Salzburg, Geneva, Lausanne, Arnhem, Zurich and Rome. New trolleybus systems are currently being built in Venzuela and China. Trolleybuses do provide the backbone on-street service in many places, for example Athens, Arnhem and Moscow. In Moscow, the city with the world's largest trolleybus system, both trolleybuses and trams are still being developed. Trolleybuses outnumber trams two to one (around 600 to 800) and are a similar size to the trams. In central Moscow, trolleys are the dominant mode of surface public transport, covering the city centre comprehensively. In contrast only one tram line penetrates the centre and this does not even reach the most central areas round Red Square. Weren't trolleybuses known as the "Silent Death"? Yes. They run so quietly that the Glaswegians mistakenly called them the “Silent Death” because of the perceived likelihood of getting knocked down due to not hearing one. In fact the safety statistics of trolleybuses are every bit as good as for diesel buses due to their powerful brakes and the friction afforded by rubber tyres. Didn't they get rid of trolleybuses in London? Yes, they did. But they also got rid of trams - in favour of trolleybuses. Does this suggest that we shouldn't consider trams? Weren't trolleybuses considered as an alternative to trams in Edinburgh before? Yes, trolleybuses were mentioned in the parliamentary scrutiny, but only in one paragraph, compared to four for a guided bus. There appears to have been no cost:benefit analysis of trolleybuses. This was confirmed by Transport Initiatives Edinburgh (TIE) who were "unable to trace any information concerning trolleybuses and costs comparisons". So what was said about trolleybuses in parliament then? Trolleybuses were popular during the 1950’s. In Western Europe today only about 40 systems exist and, in some cases, these are outmoded. They have less capacity than trams and can be inefficient and are prone to breakdown and interruption in service which may contribute to a lesser ability to effect modal shift than tram. There are no UK systems at present. The last local authority to operate a system was Bradford where operation ceased in 1972. Is there anything wrong with this statement? While trolleybuses were popular in the 1950s, they were also popular in the 1930s and 1940s when they replaced or supplemented tram operation in many UK towns and cities. While there are "only" 40 systems in western Europe, there are over 340 trolleybus systems in the world (source: trolleymotion.com), compared to about 420 tramways and light rail systems in the world (source: lrta.org) - not a huge difference. In any case, perhaps a greater factor in choosing a tram or trolleybus system should be the characteristics of the town or city the scheme is proposed for, rather than numbers. A number of the western European systems may be "outmoded", but comparative count of "outmoded" tram systems is not given. It is true that some of the Eastern Europe are old, but this could be seen as testimony to their inherent longevity. The only definite reasons given for rejecting trolleybuses are that: trolleybuses have a smaller capacity than trams, which is true but less so for modern trolleybuses (see What's the capacity of trams and trolleybuses? ); and that they are less reliable than trams, which is questionable (see Aren't trolleybuses less reliable than trams?). Edinburgh is a World heritage site. Won't the installation of the overhead wires be blocked by Edinburgh World Heritage and the Cockburn Society? Trams have overhead wires too and this didn't prevent the tram scheme being approved. It is not clear that one extra wire in either direction is qualitatively different. The historic tourist city of Salzburg is close to 100% trolleybus operation of city bus services and does not find overhead wires to be a problem. Also, if the heritage bodies do feel that two wires is qualitatively worse than one, trolleybuses can and do run extensively off-wire, when required (for example in Rome, where overhead wires are not allowed in the historic city centre). How will bus routes change if the Edinburgh tram phase 1 goes ahead? As of December 2006 according to the Transport Edinburgh business plan, this is the plan.